The black tar paper around the window openings is for durability and to protect the window sills. As you can see below, the corners of the openings have water and ice shield for further protection. The InLine Fiberglass windows are triple pane low-e casements with fold down cranks and colonial grids between the window panes. All of the windows in the Hansen House have white exteriors and Oak laminate interiors, except for the windows in the garage which have brownstone exteriors and Oak laminate interiors. Using the window orientation as a reference point to help determine where the sconce should go, our Project Manager had the great idea to put the sconce on a 2×4 and have the homeowner move it up and down the wall to help him visualize where he wanted it placed. These exterior shots show the timber framed side porch, without the roof on it yet, and the installed windows. The Marvin Integrity Center Hinge French Doors with sliding screen are found on by the side porch and off of the front of the great room. This custom entry door’s arch matches the arches of the existing barn and mill house. The arched door is located under the timber framed entry way which is part of the wrap around front porch. The next post will cover the spray cellulose insulation so check back to learn all about it! HJLCMS has been very busy finishing up the KSQ Barn/Carriage Shed. The last update ended with the exterior being prepared for the siding and the installation of the standing seam metal roof. However, before the siding could go on, the windows had to be installed and the electric had to be run. Once the windows were in and the electric had been run, the siding could be installed. The material for the exterior finish is rough sawn board and batten for the first story and a cedar shake for the second story, upper gables and cupola. While this was going on, one of the HLTF crew members was building the cupola in our shop. The cupola was then transported to the job site where it was finished with cedar shakes and standing seam metal roofing. This cupola is not solely ornamental, as it will function as passive climate control as well as house the ventilating fan. The cupola was then flown into place with the crane. Check back for the next update. 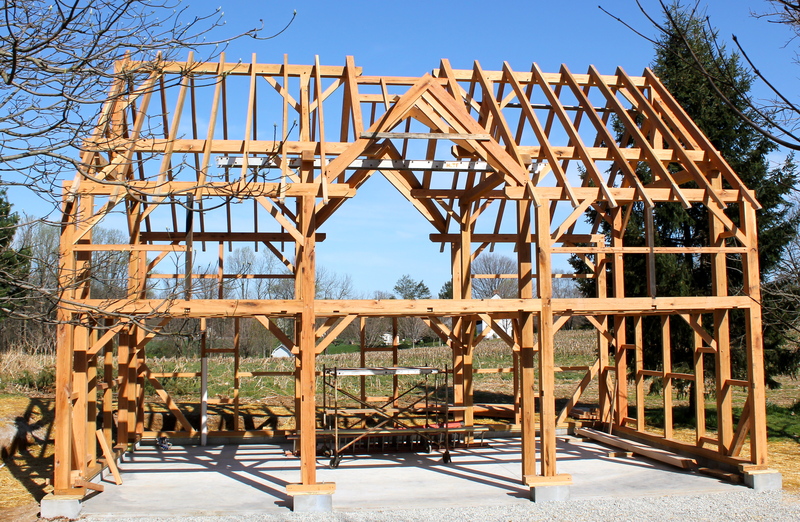 Hugh J. Lofting Construction Management Services, LLC (HJLCMS) is currently working on completing the construction of a timber framed carriage shed that had been raised by its sister company, Hugh Lofting Timber Framing, Inc. (HLTF). Once the HLTF crew had completed raising the two-story 24×36 Oak timber frame, HJLCMS took the reins and began enclosing the structure. The frame sits upon an insulated concrete slab, which contains pex tubing for a radiant heat system. This heated floor along with the tightly insulated walls should allow the homeowner a comfortable working environment even in the dead of winter. The 1×10 Eastern White Pine tongue & groove roof decking was the first component of the built up wall system to be installed on the timber frame skeleton. As the decking was going down, felt paper was applied to protect the roof decking from the elements. Once the roof was ‘dried-in’, the interior finish made up of 1×10 tongue & groove, eastern white pine was applied to the exterior side of the timbers to complete the first layer of the built up wall system. The white pine 1×10 T&G applied to the outside of the carriage shed beautifully highlights the exposed timber frame. Once the white pine decking was in place, the rigid foam insulation was then ready to be applied to the entire structure. The two layers of 2” EPS rigid foam board is the insulation for the carriage shed. These two layers are staggered to offset the seams, which will help to reduce air infiltration. Lath, which acts as a nailing surface for the exterior siding, is applied directly to the rigid foam insulation. The added air space from the lath is helpful as it allows any moisture that may find its way behind the siding to dry out. The second story siding will be cedar shakes while the first story will be 1×12 board and batten. In preparation for the cedar siding, the lath on the second story will be installed horizontally across the vertical members creating a breathable lattice framework. The standing seam metal roof is 24-gauge steel with a medium bronze finish. Check back for more updates as the construction process continues.